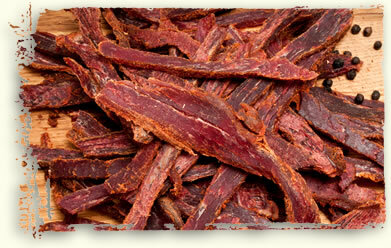 Our first jerky flavor, Original is what started it all over 30 years ago, and is a favorite of many around the world! Like all our jerky flavors, it's made by hand using John's unique process and secret blend of spices. A little spicy. A little sweet. It will simply blow you away. Also available in a lower salt version made with 40% less salt. IngredientsBeef, water, salt, sugar, flavorings, lemon pepper (sugar, flavorings, maltodextrin, salt, dextrose, dehydrated lemon peel, citric acid, oil of lemon, sunflower oil) and sodium nitrite. *Sprayed with potassium sorbate to maintain freshness. Our jerky is 100% handmade in the USA.